Going to a dinner party? Or meeting a friend or family member at the airport? There are a multitude of reasons why giving for the sake of just `giving` can be applied to a bouquet of flowers. 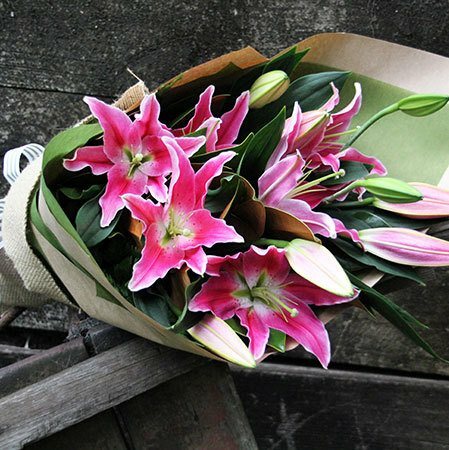 Our elegant and classic bouquet of perfumed oriental lilies is the perfect flower arrangement to surprise someone with, for no particular reason at all. These popular blooms come in either pink or white, and are wonderfully long-lasting. Be sure to let our florists know if you require a presentation bouquet and we will make sure to use open blooms to show off the colours. Otherwise we endeavour to include as many closed buds as possible to add to the longevity of your bouquet. *PLEASE NOTE: This bouquet is priced for delivery to MOST major Australian cities. For flower deliveries outside major metropolitan cities and to rural locations, please note a surcharge may need to be applied to place your order via an affiliate florist network. If this is the case, a team member will be in touch once we have received your order to provide information and advice. Alternatively, give us a call on 1800 66 66 46 or email sales@flowersforeveryone.com.au and we will be more than happy to help!